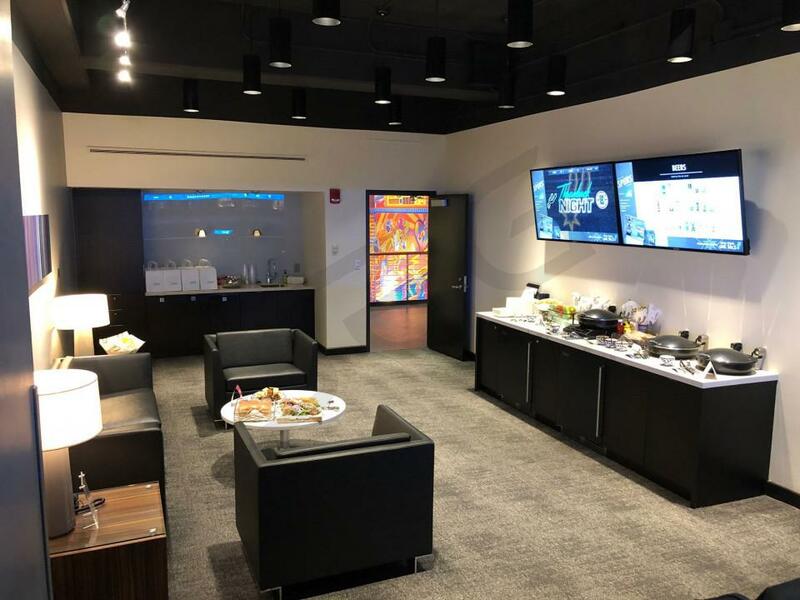 How much do Spurs suites cost? San Antonio Spurs suite pricing will vary by opponent, day of the week, and suite size/location. 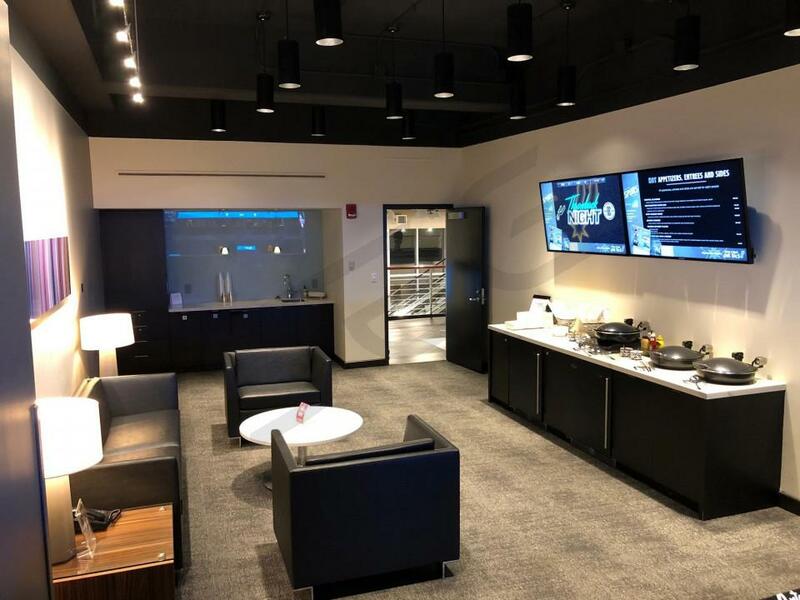 On average, private suites for Spurs games will be priced between $3,900 - $7,500. 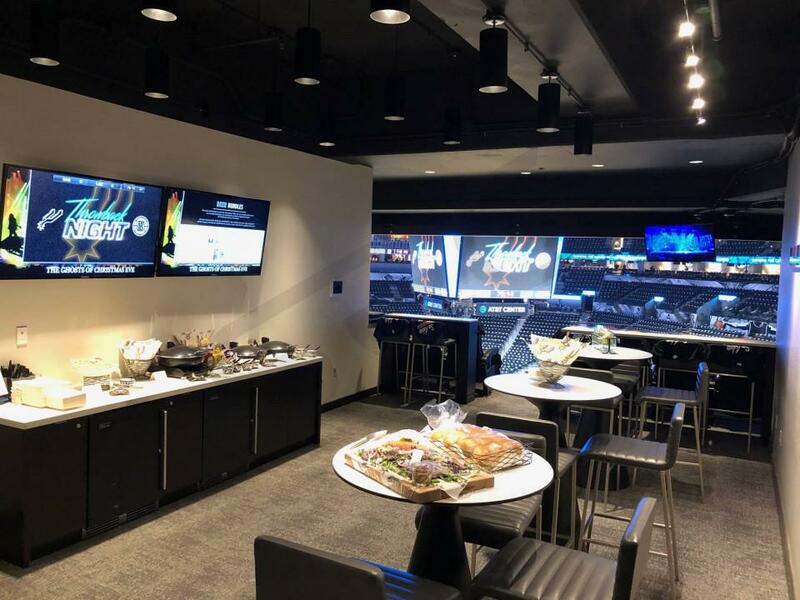 Included with any Spurs suite reservation will be tickets, parking passes and, in most cases, a food and beverage credit. 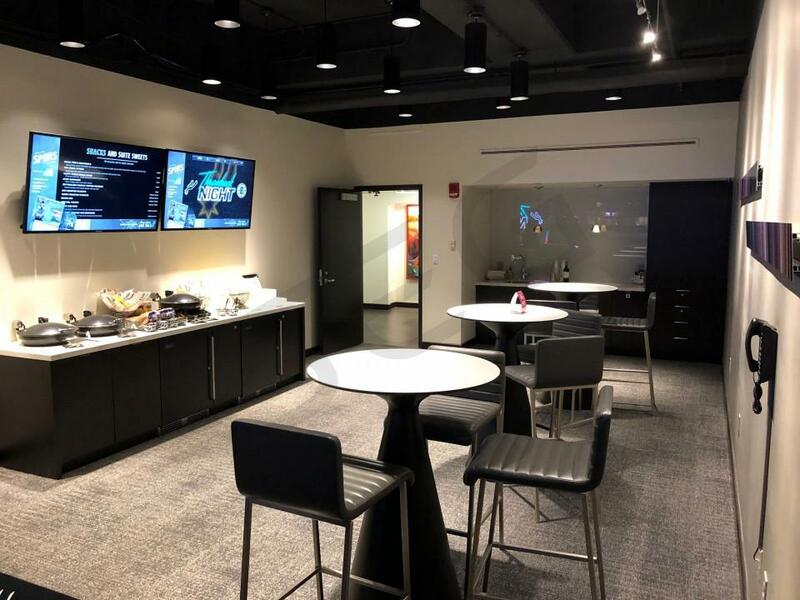 Suite prices for concerts, rodeos and other events at the AT&T Center will vary widely by event. 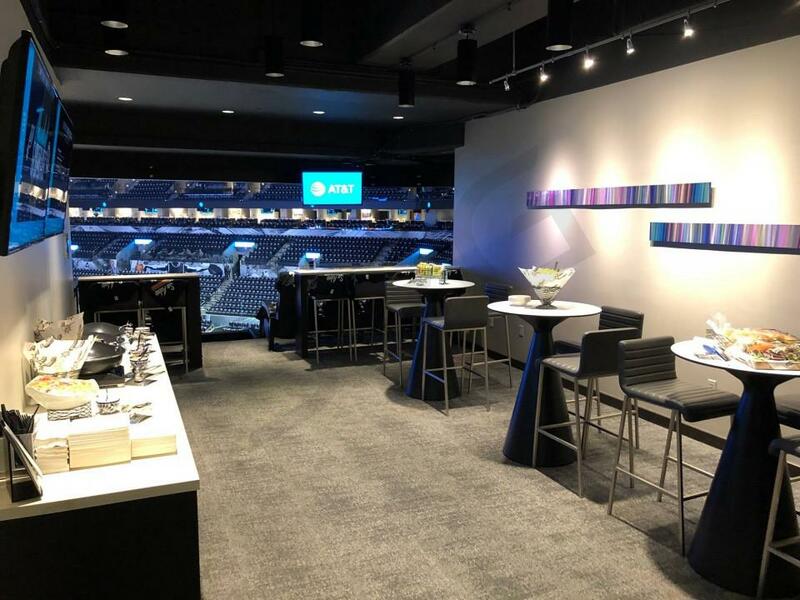 Terrace Suites are located on the main suite level at the AT&T Center. Terrace Suites come fully private to your group; most Terrace Suites will accommodate between 16 and 24 guests. 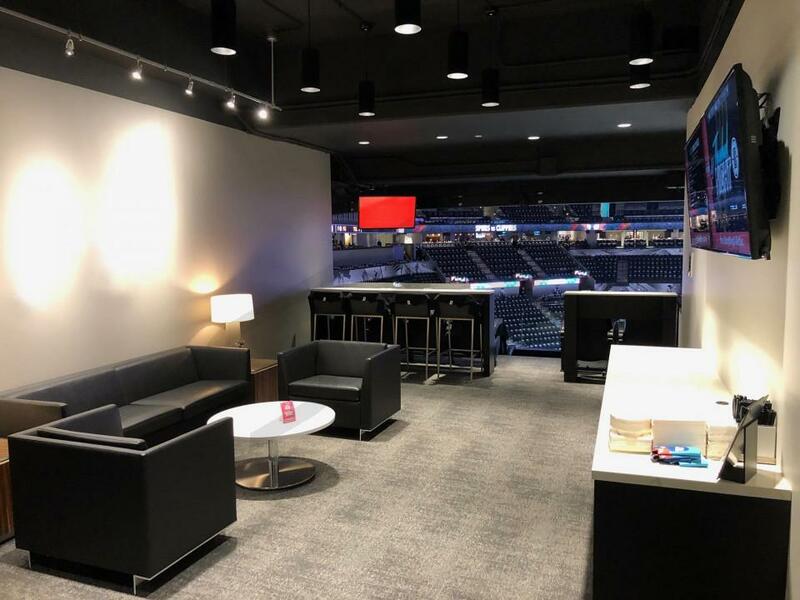 Suites feature cushioned stadium-style seating on an open air balcony overlooking the court in addition to an assortment of lounge seats and barstools configured around the suite. All suites are furnished with a bar/kitchenette, multiple HDTV's, and in-suite WiFi. 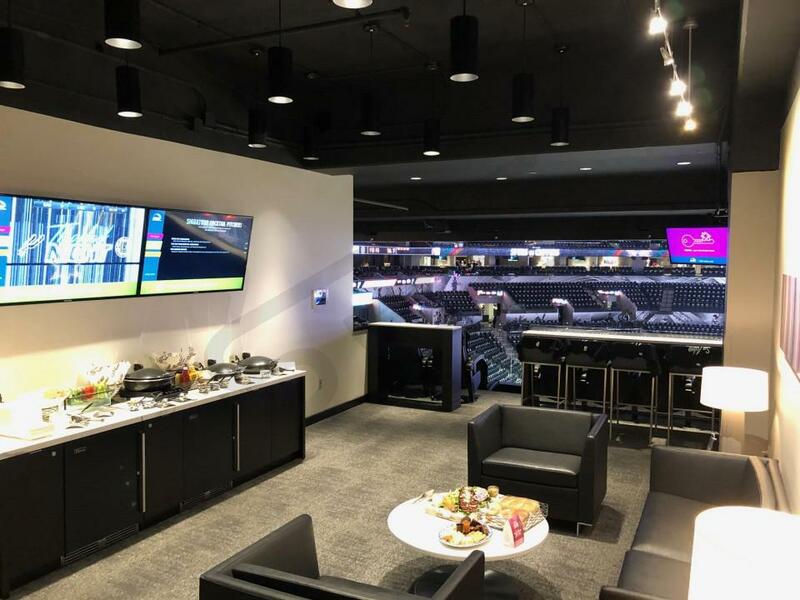 Suite Experience Group helps customers to plan corporate and personal events at AT&T Center. 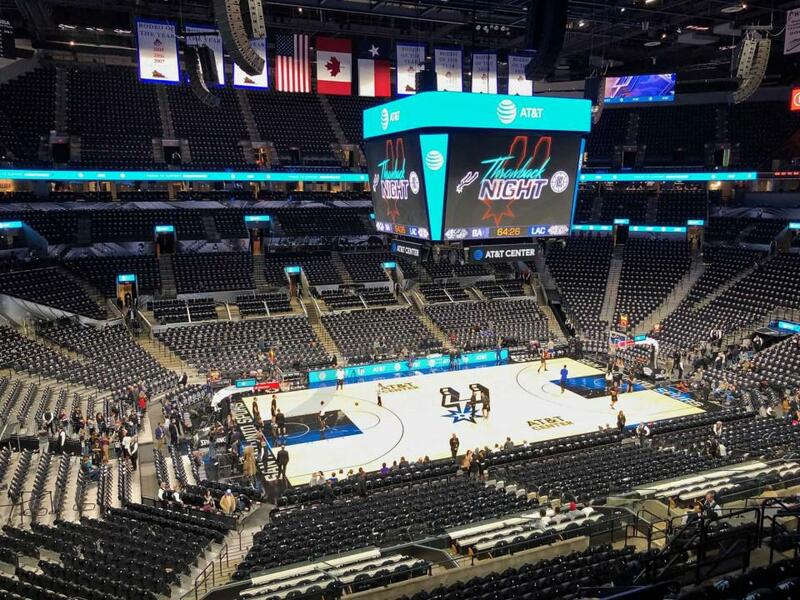 In this section we’ve compiled key considerations when planning an event at the AT&T Center. 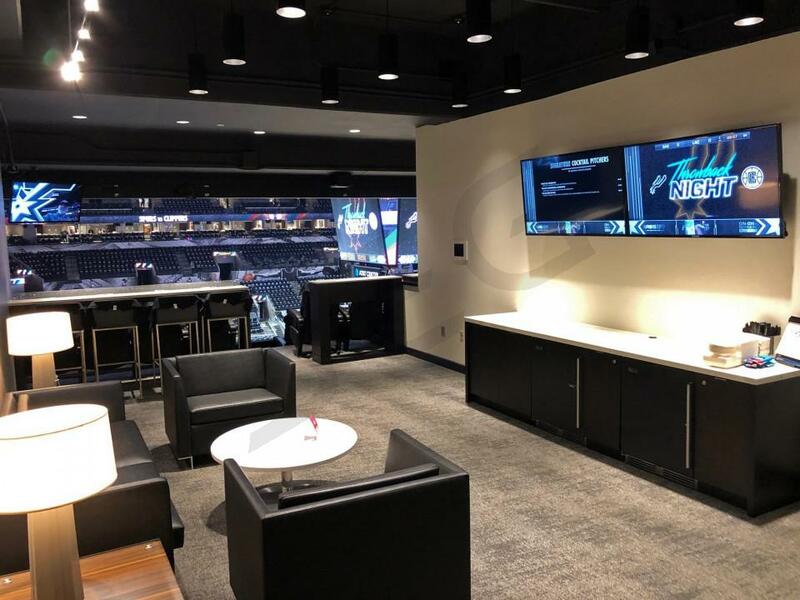 There are several sizes and configurations for suites at the AT&T Center. 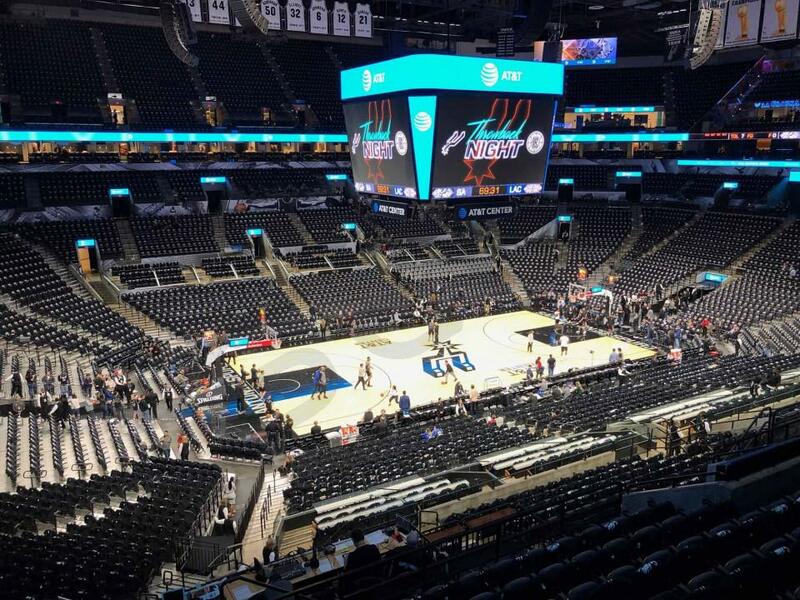 The smallest suites at AT&T Center have 12 fixed seats and 4-6 bar stools, with the option to purchase up to 8-12 additional standing-room only (SRO) tickets for a maximum capacity of 28 guests. The largest suites have 21 fixed seats and can max out at a 33-person capacity including the SRO tickets. There is additional interior seating in the suite that can accommodate an additional 4-6 guests. There is a wide range in suite cost at the AT&T Center. 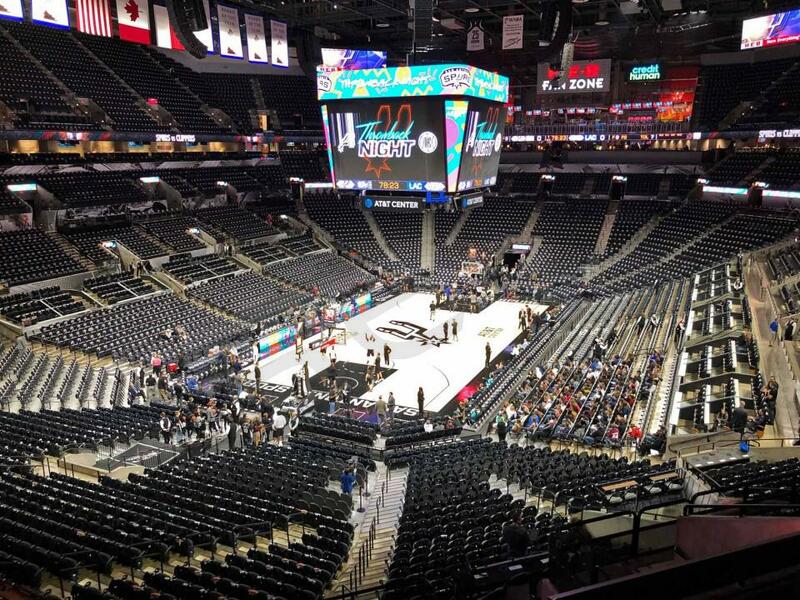 Third-party events such as the Harlem Globetrotters can start as low as $500 per suite, while a good suite location for the highest demanded Spurs games can be priced above $15,000 per game. Suite Experience Group can help you determine which events will fit into your budget. 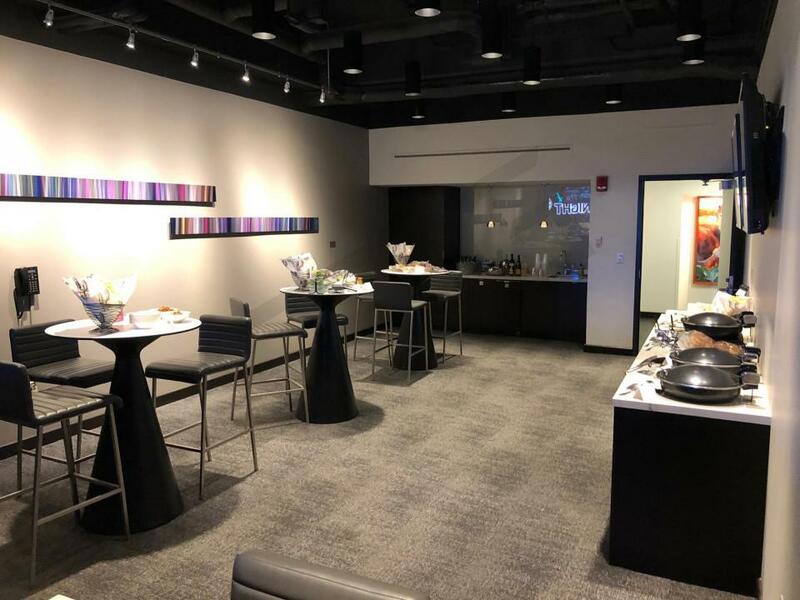 In-suite catering is available in all suites at the AT&T Center. The menu includes a wide range of food and beverage options provided by Levy Restaurants. 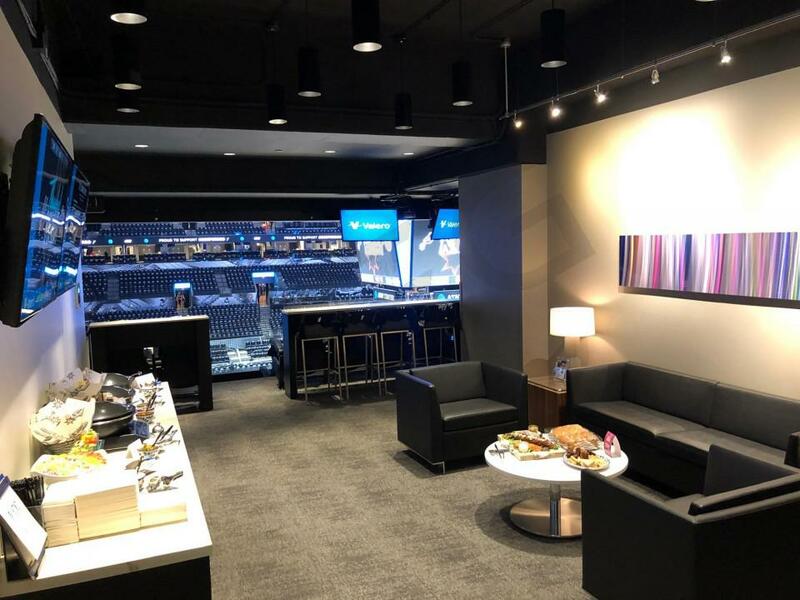 On average, Suite Experience Group clients at the AT&T Center spend approximately $1,900 on in-suite catering. The bill can go even higher depending on the group size and the amount of alcohol consumed. 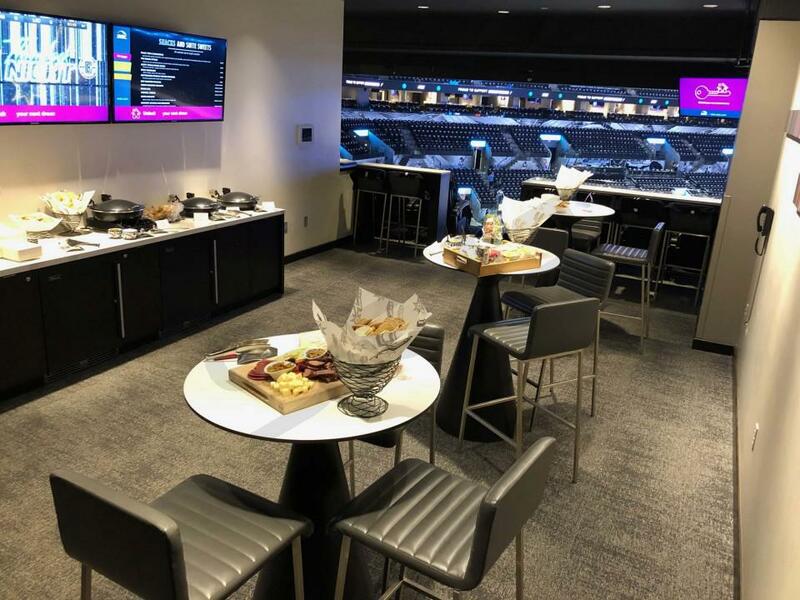 Suite Experience Group will provide the AT&T Center catering menu and can advise on the appropriate budget and catering order for your group. 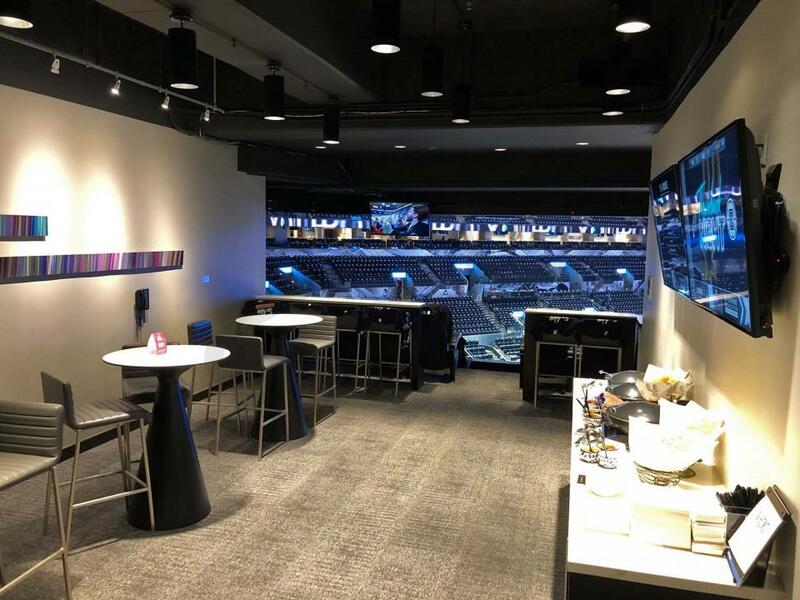 There are 2 clubs at the AT&T Center located on the club level: Frost & Dahill Saddles & Spurs Club and the SWBC Terrace Club Restaurant located on the Terrace Level. 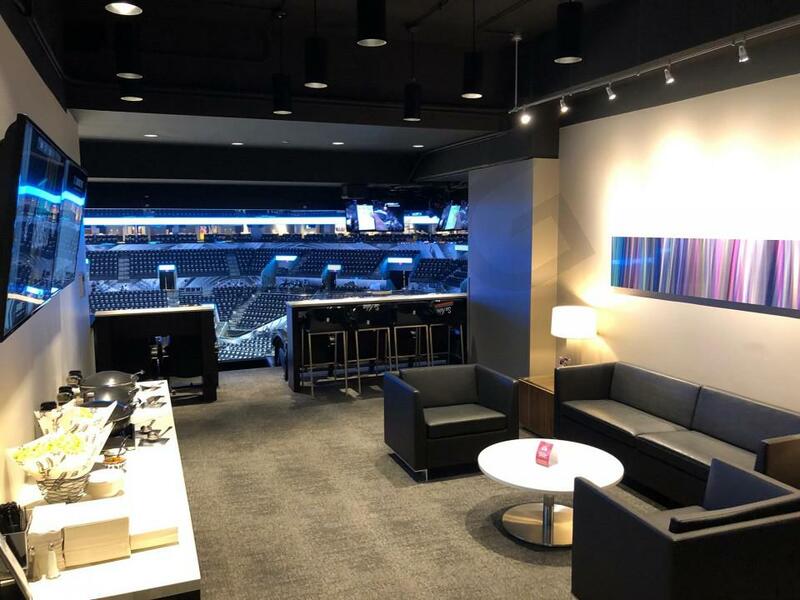 When you purchase a suite at the AT&T Center you will have access to both club areas. There is no right answer here, and it ultimately boils down to what others in your group will be wearing. If it’s a corporate event, many guests will likely be dressed in business casual attire. However, it’s not uncommon for guests to wear jerseys of their favorite player, jeans, or even shorts on a hot day. 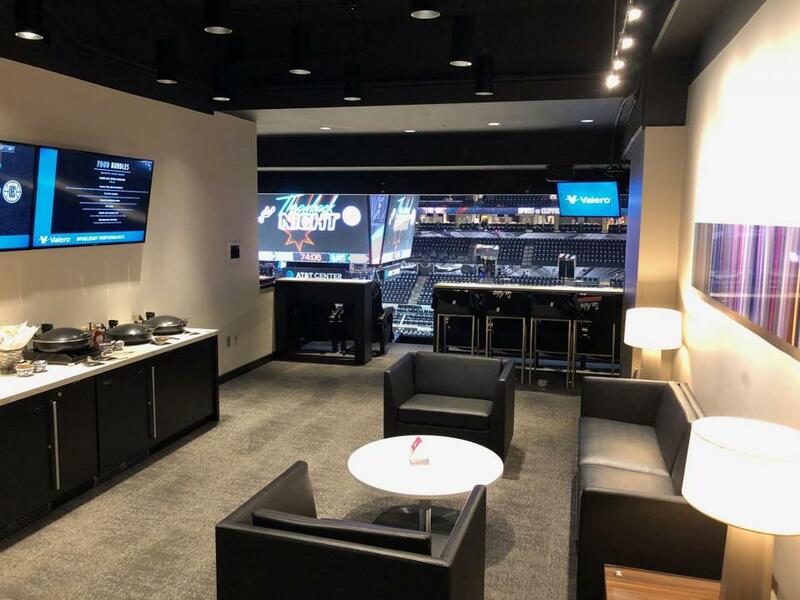 The luxury suites at the AT&T Center are climate controlled and have a coat closet for storage. All bags will be screened by Security upon entrance to the AT&T Center at all events. All bags are restricted to the standard 12” x 12” x 6”. Any bags larger than 12” x 12” x 6” and all backpacks regardless of their size are prohibited. These items will not be held or checked-in at the arena. Guests without bags are encouraged to use the "EXPRESS: No Bags" lanes to expedite the security process. The AT&T Center has 10 parking lots in total. Suites at the AT&T Center will come with parking passes valid in designated VIP lots. You can follow the directions on those passes to identify the best entrance for your suite. Larger groups wishing to travel to the stadium together often opt for a bus. Busses and RV's (oversized vehicles) can enter Gate E from the AT&T Center Parkway; passengers will be dropped off in front of the SE VIP entrance and the bus will be directed to a designated holding area for the game. Parking lots open 3 hours in advance of all events at the AT&T Center. Premium Doors will open 2 hours before tip-off for a Spurs game and typically 1 hour prior to concerts. Enter Gate B or Gate C off Houston Street to park in Lot 2; enter via the SW VIP Entrance. Enter Gate C off Houston Street or Gate D from the AT&T Center Parkway to park in Lot; enter via the SE VIP Entrance. Enter Gate D or Gate E from the AT&T Center Parkway to park in Lot 4NE; enter the NE VIP Entrance. Spurs Sports & Entertainment has designated the AT&T Center as tobacco and smoke-free building. The policy includes all forms of smoking and tobacco use, including but not limited to: cigarettes, cigars, electronic cigarettes, personal vaporizers, smokeless tobacco and tobacco pipes. 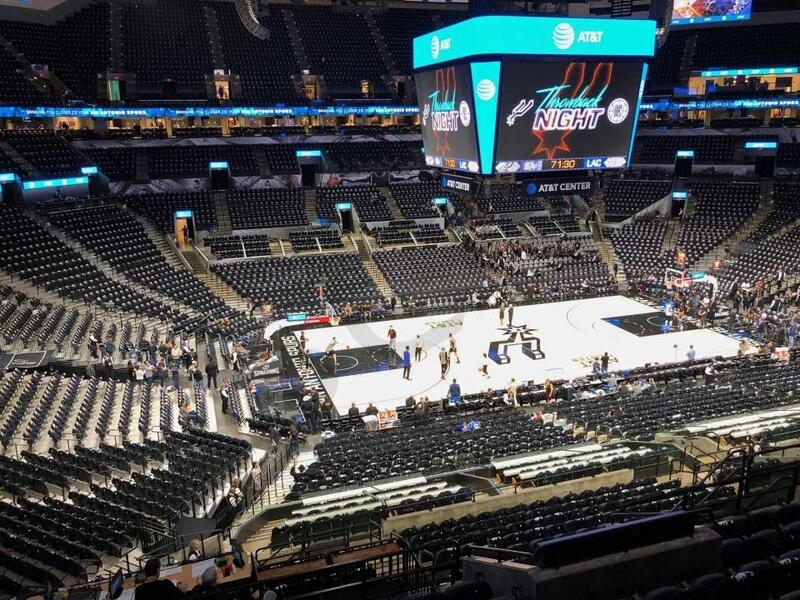 There will be no designated smoking areas anywhere inside the AT&T Center. The tobacco and smoke-free environment extends 500 feet from the AT&T Center. With the Kawhi Leonard drama finally past the Spurs, Gregg Popovich will look to lead the Spurs back to a top seed in the Western Conference. Despite playing without Leonard most of the season, San Antonio still managed to win 47 games. Now with a healthy DeMar DeRozan playing in place of Leonard, the Spurs fully expect to contend with the best of the west this season. The undisputed leaders of the Spurs are now LaMarcus Aldridge and DeMar Derozan. Aldridge enjoyed a resurgent year last season, making the All-Star Game for the sixth time in his career. DeRozan comes over from Toronto, where he spent the first 9 years of his career. An elite scorer with explosive leaping ability, DeRozan is one of the top 25 players in the NBA. He should excel under Coach Pop, giving Spurs fans plenty of reasons for excitement. There is no denying that this San Antonio Spurs team will look different from past years. Tony Parker is now in Charlotte, and Manu Ginobili decided to call it a career after 16 remarkable seasons. While the Spurs will certainly miss Parker and Ginobili, their absence will open up more playing time for San Antonio’s young guards to shine. Dejounte Murray is one of the bright young stars in the NBA, and the Spurs will rely on him as the full time starting point guard this year. Murray is an elite defender with incredible athleticism - once he sharpens his offensive game, watch out. The Spurs are also excited about rookie Lonnie Walker IV, the electric shooting guard who general manager R.C. Buford selected in the first round of this year’s draft. Veterans Pau Gasol, Rudy Gay, Patty Mills, and Marco Belinelli will also play key roles for the Spurs this season. Even though the Spurs may not have the same team that won 5 championships, any Coach Pop team with this much talent is a contender. 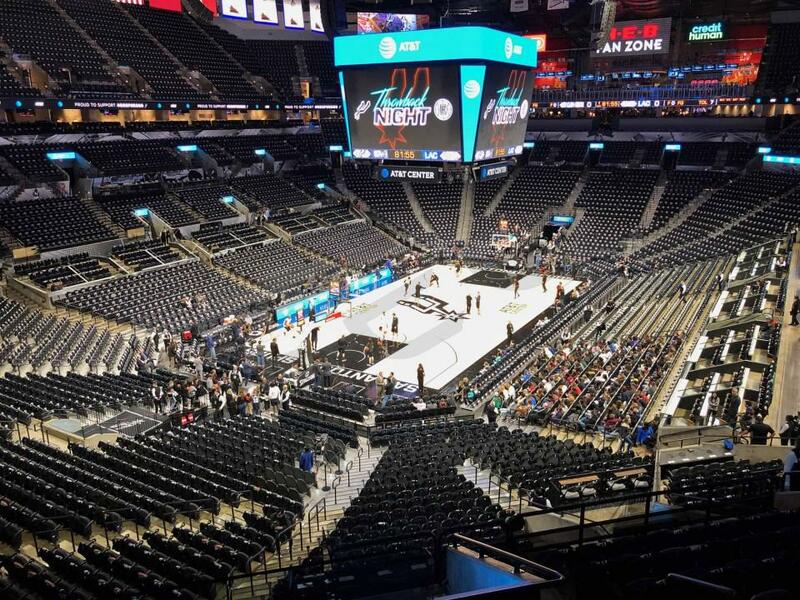 Be sure to watch the San Antonio Spurs live from a AT&T Center luxury suite. 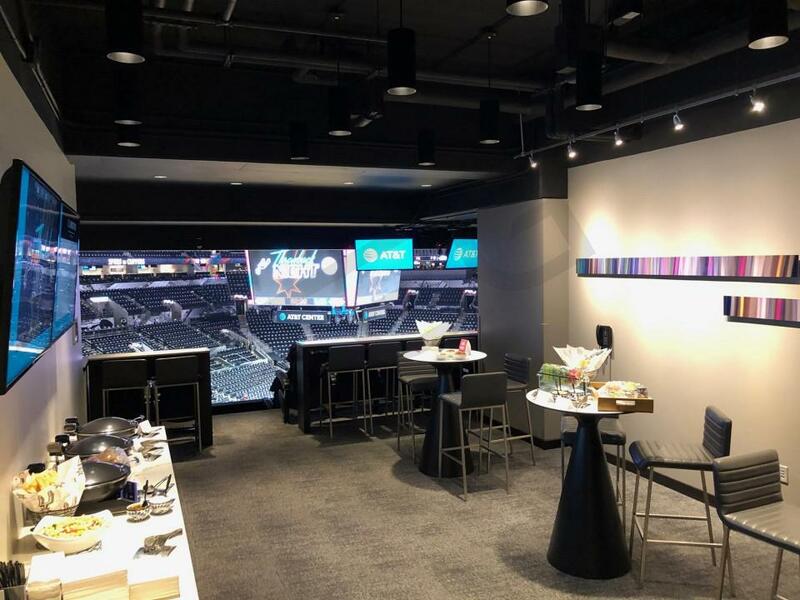 AT&T Center Terrace suites include 16 tickets with an option to purchase up to 8 additional suite tickets. Your entire party will get private entry into the AT&T Center as well as VIP parking. Choose from numerous in-suite catering options and watch every replay on HDTVs inside your suite. AT&T Center suites will also feature balcony seating, interior lounge seating, upscale furnishing and a dedicated suite attendant. Whether you are planning an event with friends and family or for business, a Spurs Terrace suite is the perfect environment for any occasion. The San Antonio Spurs had an excellent 2015 season finishing 67-15 and getting to the second round of the Western Conference Playoffs. Although the Spurs had championship aspirations and the second round boot was a disappointment, San Antonio is locked and loaded for another run at the Larry O’Brien Trophy. Two-time NBA Defensive Player of the Year and 2014 NBA Finals MVP Kawhi Leonard is back and looking to continue his emergence as one of the best players in the league. Leonard averaged career-highs of 21.2 points per game, 2.6 assists per game, 6.8 rebounds per game, 1.0 blocks per game and 1.8 steals per game. To complement their rising star the Spurs have quality starters Tony Parker and Danny Green. Parker is a former All-Star and used to be one of the best players in the League, but as he has aged so has his game. He is now a quality starting point guard who can beat almost anyone off of the dribble. Danny Green is one of the best shooters in the NBA and can stick with almost anyone on the defensive side of the ball. On the interior is five-time All-Star power forward LaMarcus Aldridge. Aldridge came back to his home state of Texas in the 2015 offseason and once again had a dominant year in 2015. Aldridge averaged 19.2 points per game, 8.5 rebounds per game, 1.0 block and 1.5 assists per game, all great numbers for an aging power forward. In the offseason, the Spurs signed Pau Gasol, David Lee, Dewayne Dedmon, and resigned Manu Ginobili. The most important of this group is definitely Spanish big man Pau Gasol. Gasol will be a perfect fit in the Spurs passing focused offense as a facilitator at the high post. Lee is an established veteran who knows how to win and has playoff experience while Dedmon provides this group with upside as a super athletic big man who specializes in dunking. Getting Manu Ginobili to resign for another year was also a big win for the Spurs as he is the leader of their bench unit. Coming off of his last Olympic appearance he will provide scoring and creative playmaking for the Spurs. Assuming all the pieces are integrated smoothly, the Spurs should be competing for one of the top two seeds in the West. 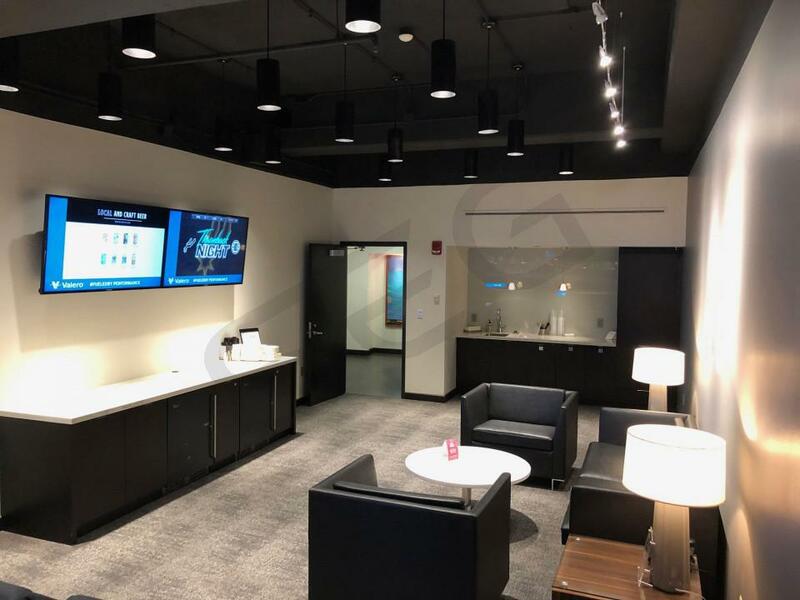 The Spurs will be a playoff team in 2015-16 and you can see the Spurs take a shot at another title from a private luxury suite at the AT&T Center. San Antonio Spurs Terrace suites include 16 tickets with an option to purchase up to 8 additional suite tickets. Your entire party will get private entry into the AT&T Center as well as VIP parking. 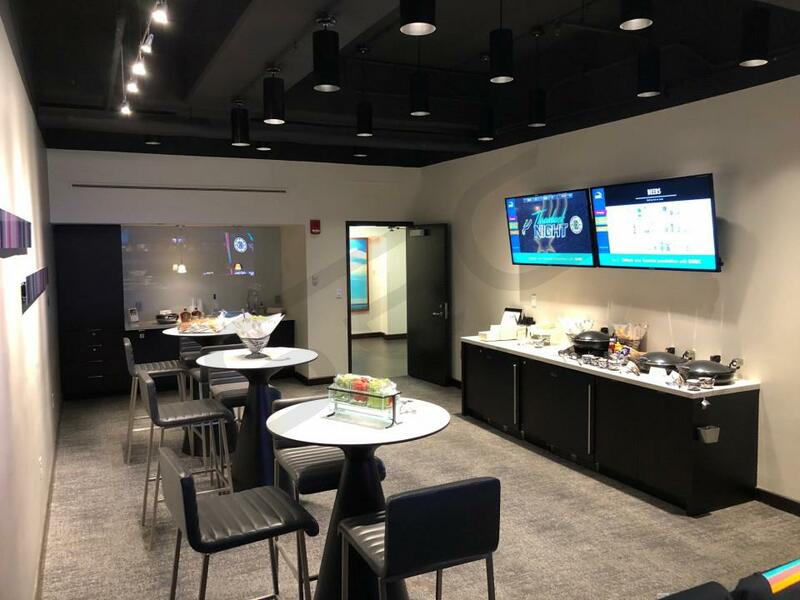 Choose from numerous in-suite catering options and watch every replay on HDTVs inside your suite. Spurs’ suites will also feature balcony seating, interior lounge seating, upscale furnishing and a dedicated suite attendant. Whether you are planning an event with friends and family or for business, a Spurs Terrace suite is the perfect environment for any occasion. The AT&T Center will also host Mana, Bad Boy Reunion, Demi Lovato, Nick Jonas and the 5 Seconds of Summer Concert Tours. The San Antonio Spurs continued their dominance in 2013-14 by defeating the Miami Heat for the NBA title. It was one of the team’s best seasons under head coach Gregg Popovich, winning 62 games. It was also the Spurs 15th straight season with 50 or more wins. With all of the stars returning in 2014-15 the Spurs should have no problem contending for another NBA Championship. Tim Duncan, Manu Ginobili and Tony Parker continue to prove they have plenty left in the tank. The Spurs will lean more heavily on their Finals MVP Kawhi Leonard this year. Although the Western Conference title looks to be as competitive as it has ever been. 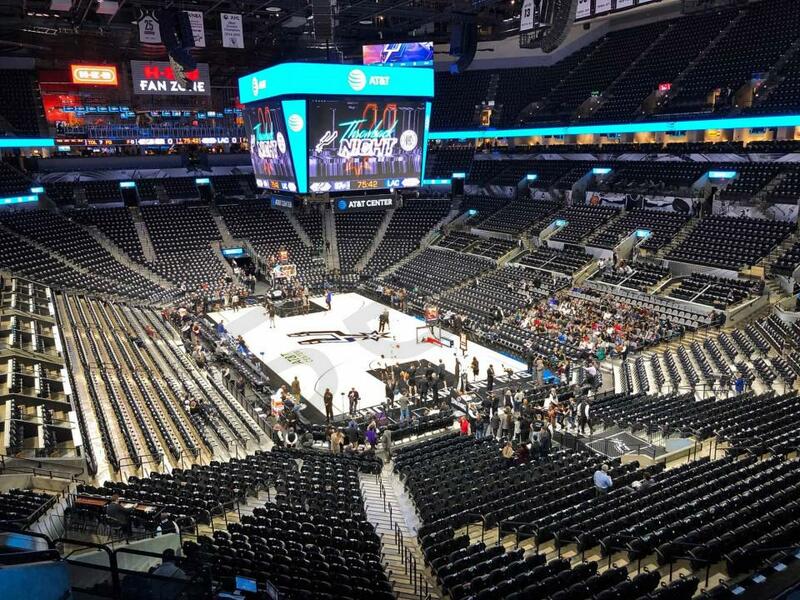 You can watch the Spurs take a shot at another title this year from a private luxury suite at the AT&T Center. 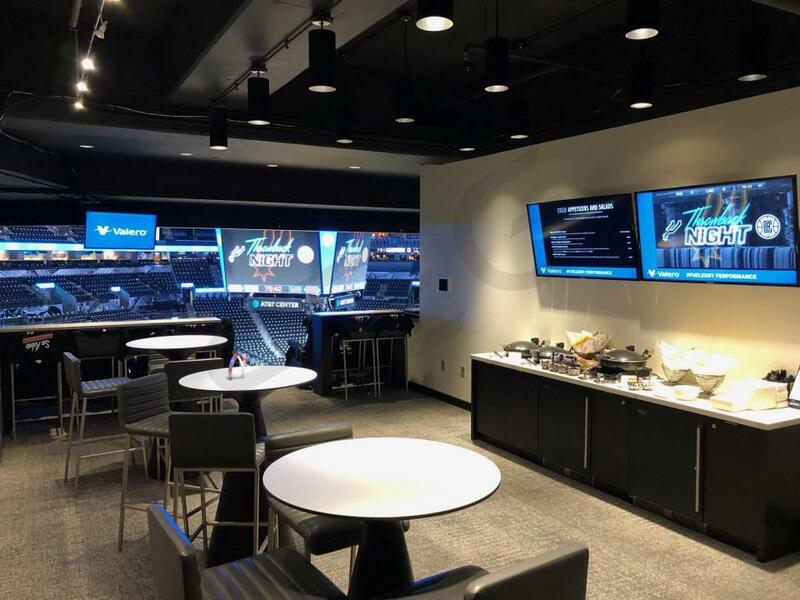 San Antonio Spurs Terrace suites at the AT&T Center include 16 tickets with an option to purchase up to 8 additional suite tickets. Your entire party will get private entry into the AT&T Center as well as VIP parking. Choose from numerous in-suite catering options and watch every replay on the HDTV inside your suite. Whether you are planning an event with friends and family or for business, a Spurs Terrace suite is the perfect environment for any occasion. Thank you for signing up for specials at AT&T Center. Enter your email address below to stay in touch. We'll sign you up for our newsletter, which will inform you of the latest inventory and events at AT&T Center. We promise we will never sell or distribute your information. 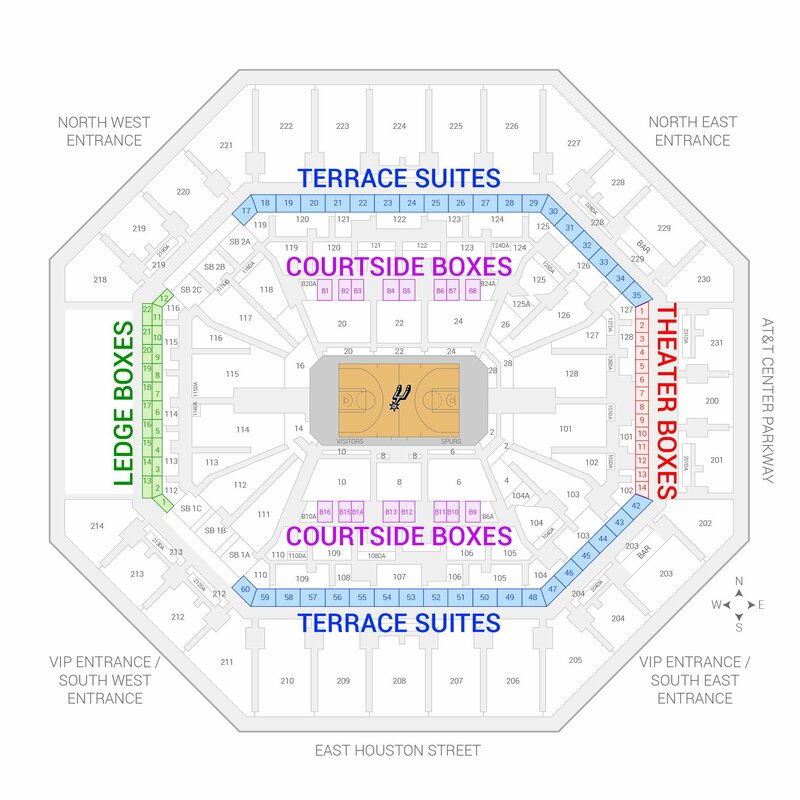 The seating chart below shows where the San Antonio Spurs suites at AT&T Center are located.